Paris, France (April 5, 2017) – Ymagis Group, the European specialist in technologies for the cinema industry, today reported its consolidated financial results for the 2016 fiscal year, ending 31 December 2016, as approved by the Group’s Board of Directors following its meeting on 04 April 2017 (audit procedures are underway). In 2016, Ymagis Group maintained its strong growth momentum, reporting revenues up by +13% at €178.2M, primarily due to the acquisition of businesses completed both in 2015 and 2016. In line with the Ymagis Group business plan, the services business units showed substantial growth, generating revenue in 2016 that was up nearly +30% at €108.7M, representing 61% of the total Group revenue. This increase confirms the Group’s strategy to compensate for the anticipated decrease in revenue generated by the VPF business unit – down 5.8% at €69.5M – following the first VPF recoupments in Europe. After two fiscal years driven by external growth and marked by two major acquisitions – dcinex and Eclair – in 2016, the Group focused its efforts on its structural reorganization and the effects of consolidation and optimization. 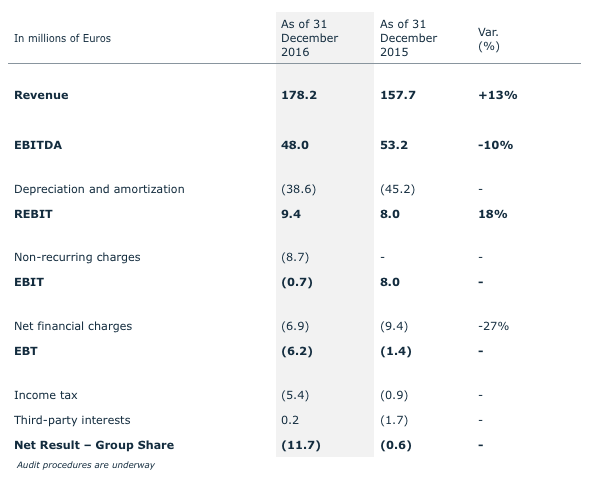 EBIDTA in 2016 was down 10% at €48M, representing 27% of revenues compared to 38% on 31 December 2015, primarily due to the full-year integration of Eclair, the payroll increase (+40%) as well as other purchases and external expenses (+34%). Consumed purchases mainly relating to CinemaNext’s activities are stable and in line with the usual level of business. Income operations (REBIT) in 2016 were up 18% at €9.4M compared to €8M for the previous year period, thanks to lower charges related to depreciation and amortization which fell from €45.2M in 2015 to €38.6M in 2016, taking into account the first VPF recoupments both in Austria (268 screens during Q3 of 2015) and in Poland (89 screens during Q1 of 2016). The implementation of cost-saving measures and steps to ensure synergy between its two services business units in order to increase its financial performance required assets depreciation. As result, non-recurrent charges amounting €8.7M were recorded. The Group decided to entirely depreciate the RBC technology (used for the broadband delivery of content to cinemas and now fully replaced) for the sum of €7.9M. Net financial expenses continued to fall significantly from €-9.4M in 2015 to €-6.9M in 2016 under the positive effect of the reduced debt related to VPF activities. Total earnings before tax (EBT) are negative at €-6.2M compared to €-1.4M for the previous year period. The income tax burden has increased to €5.4M, taking into account firstly lower deferred tax assets and secondly the accounting of taxes paid by the Group’s profitable affiliates, including dcinex for €3.8M. Due to the situation explained above, the Group’s net result booked is a loss of €-11.7M compared to €-0.6M in 2015. As of 31 December 2016, the Group’s equity stands at €30.4M compared to €41.1M on 31 December 2015. In 2016, the Group proceeded with a repayment of the debt, representing €25M. After taking into account new loans amounting €3M to finance external growth, the Group’s net debt stood at €77.2M on 31 December 2016 compared to €92.6M on 30 June 2016. The leverage ratio (defined as net debt divided by EBITDA) was therefore 1.6 on 31 December 2016. Finally, its cash position stands at €20.6M, €5.4M of which is assigned to future bank loan repayments and leases related to the VPF business. In less than three years, Ymagis Group successfully implemented its external growth strategy leading to a threefold increase in its revenue and the consolidation of its services business units. After working throughout the year on the integration of these recent acquisitions and having presented its Perform 2020 strategic plan, the Group is now entering a new and profitable growth phase. Ymagis Group confidently confirms its targeted annual revenue growth rate of at least 10% for its services business units, for an anticipated profit before taxes of upwards of 5% across the Group by 2020 and the return of a positive EBIDTA in each of its business units (including content services before the end of 2017), actively contributing to the improvement of the Group’s margin. Meanwhile, the Group continues to innovate, providing additional growth leverage. After launching EclairColor, a new cinema standard based on HDR, Ymagis Group recently unveiled two innovations for cinema exhibitors: Sphera and EclairPlay. The new premium format cinema concept, Sphera, delivers a superior movie-going experience and content flexibility for cinema exhibitors. Ymagis Group has the intention to play an active role in the uptrend of premium cinemas across Europe through this new state-of-the-art turnkey solution available for all types of theatre owners. In addition, the Group recently announced the launch of EclairPlay, its new all-in-one download platform connecting cinema exhibitors and content owners. Designed for exhibitors, this platform is the only one capable of providing access across the globe to a growing range of DCP content as well as all the necessary marketing tools. The industry interest for EclairColor is picking up pace. 26 film directors and distribution companies have selected EclairColor HDR technology to release their films. To date, a total of 47 cinema screens in France, Germany and Tunisia are equipped with EclairColor technology (with 21 screens in sales backlog). Ymagis is a European leader in advanced digital technology services for the cinema industry. Founded in 2007, the Group is headquartered in Paris and has offices in 23 countries with close to 770 employees. Our core business is structured around three main units: CinemaNext (exhibitor services: sales and field services, software solutions, customer service/NOC and consulting), Eclair (content services: post-production, theatrical delivery, digital distribution, versioning and accessibility, restoration and preservation) and Ymagis (financial services).